Sen. Kirsten Gillibrand endorsed New York Gov. 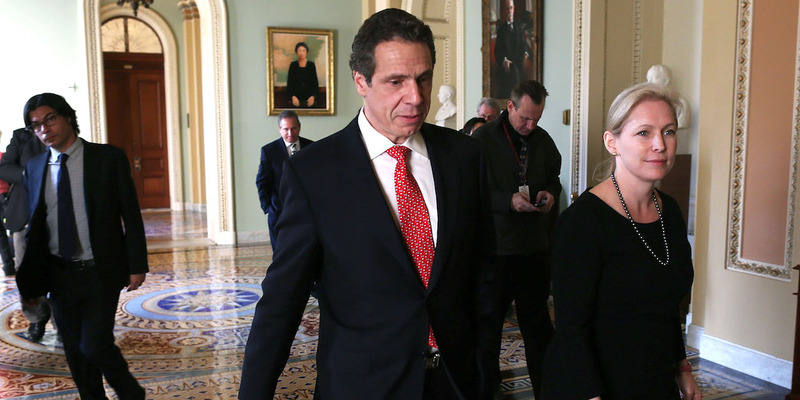 Andrew Cuomo’s bid for reelection to a third term on Tuesday. Cuomo is facing a challenge from progressive activist and actress Cynthia Nixon, in a race that may become a national flashpoint for internal party divisions. Sen. Kirsten Gillibrand got her first job in politics from Andrew Cuomo, who was Secretary of Housing and Urban Development when Gillibrand, then a corporate lawyer, approached him at a fundraiser in 2000. One of Cuomo’s aides called her the next day to offer her a job. The junior senator from New York has remained loyal to the governor since, endorsing him for reelection on Tuesday over his more progressive challenger, actress and activist Cynthia Nixon, who announced her candidacy with a scathing critique of Cuomo on Monday. “Gov. Cuomo and I are friends. But he also has done some amazing things for New York, such as passing paid leave in our state, passing marriage equality and working to end sexual violence on our college campuses,” Gillibrand told Politico, adding that Senate Majority Leader Chuck Schumer, also a New Yorker, will likely follow her. While Nixon’s bid is a longshot, according to recent polls, her campaign has the potential to galvanize the left, putting Gillibrand and other establishment Cuomo supporters on the conservative side of a internal party divide. Liberal commentators and activists quickly voiced frustration with Gillibrand’s decision. “Democratic machine politics … it’s bad, folks,” Luke Savage, a writer for the progressive Jacobin Magazine, tweeted. But Democratic operatives say the symbolic move will have little effect on voters’ thinking. It “doesn’t mean much either way,” said Bradley Tusk, a venture capitalist and former top adviser to Mayor Michael Bloomberg. “Voters rarely care about endorsements from other politicians,” except for perhaps one from a sitting or former president, Tusk told Business Insider in an email. Still, the endorsement is a bit of out of step with Gillibrand’s leftward trajectory in the Senate, where she is gearing up for a potential 2020 presidential bid. While the senator and her aides won’t confirm or deny plans for a 2020 run, all signs, including her prodigious fundraising, outreach to young people and communities of colour, and deeply anti-Trump voting record, point to the lawmaker’s higher ambitions. And she’s been quick to sacrifice powerful political relationships if she deems them harmful to her image. Gillibrand led her caucus in pressuring Democratic Sen. Al Franken, a close friend and ally, to leave office amid mounting allegations of sexual misconduct and she shocked even some of her close allies when she told a New York Times reporter in November that President Bill Clinton – her longtime supporter – should have resigned over his affair with Monica Lewinsky. But the senator will likely keep her distance from what will surely be a colourful race for governor.